Note: This page shows examples of coordination complexes, in which a number of groups called "ligands" bond to a central metal atom or ion. For more information about these complexes, see the brief introduction here. Figure SC17.1. Cis- and trans-isomers of an octahedral cobalt compound. Go to Animation SC17.1. A three-dimensional model of cis-(NH3)4CoCl2. Go to Animation SC17.2. A three-dimensional model of trans-(NH3)4CoCl2. Draw cis and trans isomers for the following compounds. Cis and trans isomers are found when there are two ligands whose spatial relationship can be described easily as "beside each other" or "across from each other". What if there are more than two ligands that can adopt different geometric arrangements around a metal? An example is found in the complex Co(NH3)3Cl3. In that compound, which has an octahedral geometry, the three chlorines might be found all in a row, or they might be found clustered into a triangle. When three ligands are found in a row on an octahedron, the geometry is called "meridional" or simply "mer". When the three cluster together in a triangle, the geometric relationship is called "facial" or simply "fac". Figure SC17.2. The fac- and mer- configurations of (NH3)3CoCl3. Go to Animation SC17.3. A three-dimensional model of fac-(NH3)3CoCl3. Go to Animation SC17.4. A three-dimensional model of mer-(NH3)3CoCl3. The fac designation is derived from the location of the three ligands whose positions are being compared: they are all found along one of the faces of an octahedron. Figure SC17.3. 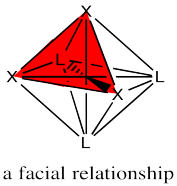 Illustration of a facial relationship on an octahedron. The mer designation comes from the fact that the three ligands are found along one meridian. 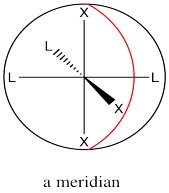 A meridian is simply a line from one apex of the compound all the way to the opposite apex. It is like a meridian on the earth, from the north pole to the south pole. Figure SC17.4. Illustration of a meridian along an octahedron. Draw fac and mer isomers of the following compounds. Some of the compounds on this page demonstrate another type of isomerism. It is called "linkage isomerism" and it involves which of the atoms in the ligand is connected to the metal. For example, the atoms at either end of a thiocyanate ion, SCN-, both have lone pairs. One or the other might bind to a metal under different circumstances. The sulfur might be attached to the metal, or else it could be the nitrogen. These two options form two different linkage isomers. Often, to communicate which linkage isomer we are talking about, the desired isomer is indicated by placing the atom attached to the metal first in the formula of the compound. For example, writing the formula [Co(OH2)4(SCN)2]+ suggests the isomer in which the sulfur is attached to the cobalt. Writing the formula [Co(OH2)4(NCS)2]+ suggests the nitrogen is attached to the cobalt. Draw structures for the following linkage isomers.